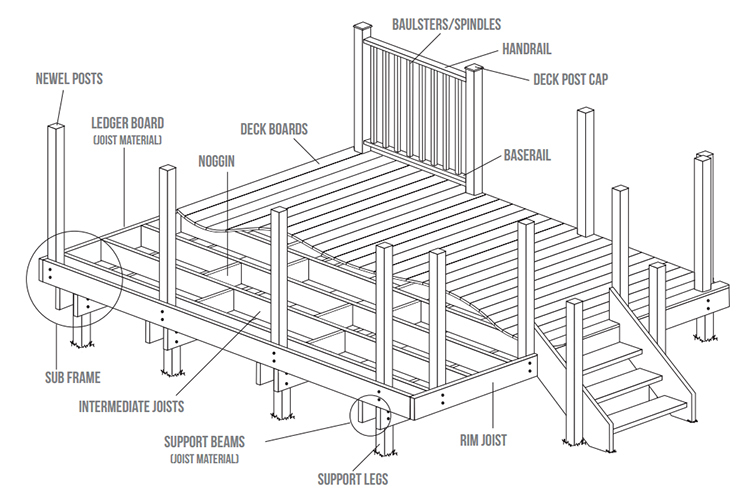 Learn how to build a simple, low level domestic deck with our comprehensive guide. 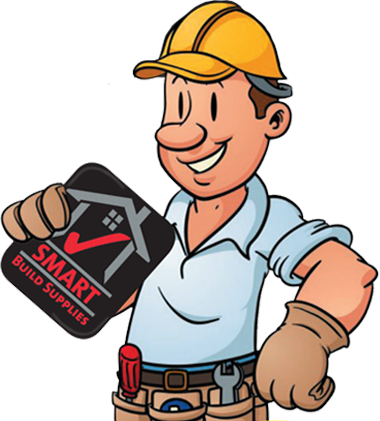 Our experts here at Smart Decking Supplies will be happy to help with any questions you might have. You should allow time to work out the best location for you new deck. It is important to areas that are permanently in the shade. Once you have decided on the location, you can begin to design and plan your deck. Make measurements and consult the experts here at Smart Decking Supplies for advice and guidance on material selection and quantities. At Smart Decking Supplies we stock deck boards in a variety of sizes and materials, including soft and hard woods. 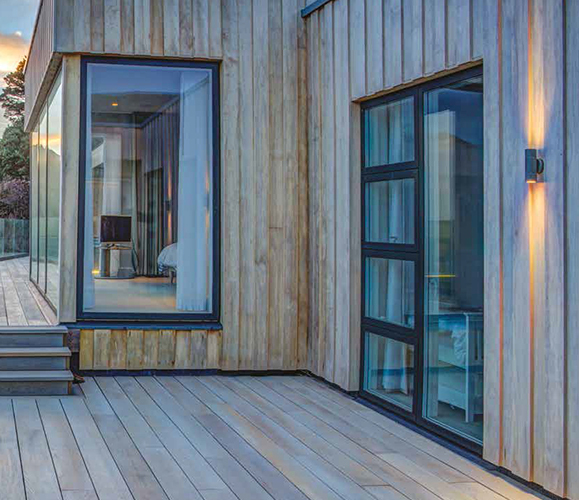 Deck boards can be bought with smooth, grooved or ribbed faces depending on your personal preferences and can be used in combination to create a more decorative effect. To ensure you design is achievable you must plan ahead before purchasing materials to build the frame. 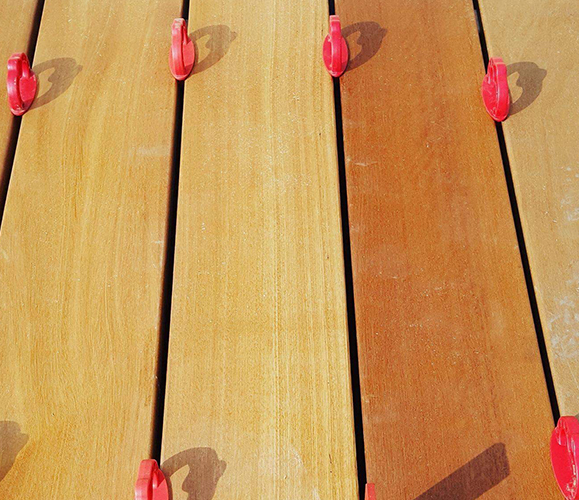 Once the plan is complete, mark out the area in which you want your new deck to be located using a combination of pegs and string. This will help you to visualize the size of the deck and will also serve as a guide for preparing the ground. Once the area is marked out, you can begin levelling it. If the site you have chosen is currently lawn you will need to remove the turf before making sure the site is level. The framework of the deck comprises of 47 x 150mm joists. These should be fixed 400mm apart at centres. To add further support to your deck, you can also fix noggins (sections of joist material) between the joists. Joists help to keep the framework of the deck rigid and provide points to fix the deck boards to. If you intend to lay the frame directly on to the ground, it is a good idea to use concrete pads at each corner and again at regular intervals in order to create a firm base. 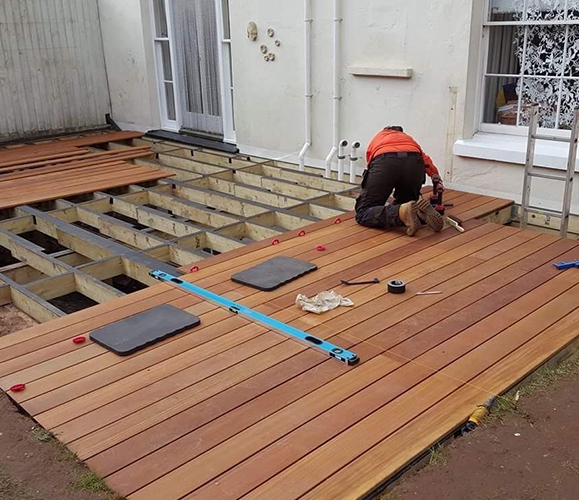 If you wish to raise your deck off the ground to cope with uneven or sloping ground, appropriately treated support legs need to be concreted in to the ground. A minimum of 60cm of each support leg will need to be set in concrete and then the concrete allowed to harden. We recommend that the they are positioned no more than 180cm apart to maintain the frames strength. The joists should be fixed to the support legs using galvanised bolts ensuring they are level. Plan where you intend to place your newel posts before fixing the support legs. Support legs don't have to be in the corners of the frame if you intend fixing newel posts in the corners. Once all the framework is in place, you can fix the newel posts by bolting them to the inner side of the joists. Cut all the deck boards to length if necessary, making sure you treat all the cut ends.Place the first board at the front of the deck, flush with the face of the joist. Fix the board to the joist using galvanised screws. We recommend using 3 screws on each joist support to be fixed along the length of the board. 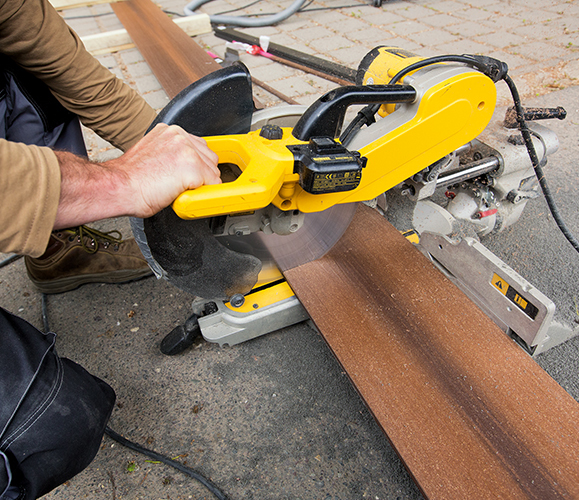 Your deck boards may need to be cut to fit around the newel posts. Fix the remaining boards to the frame in the same way leaving a small 5mm gap between each of them to allow for expansion. 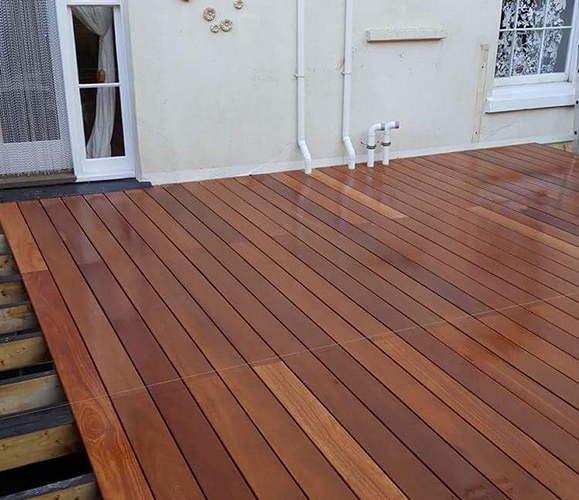 maintain the timber and integrity of your deck. 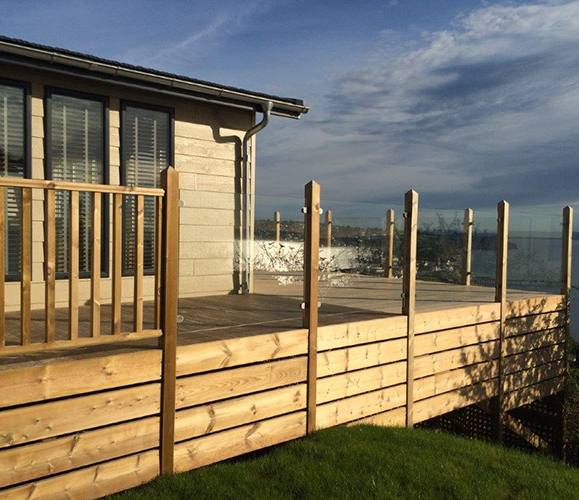 Further enhance your deck with rails and spindles. The newel posts will have been positioned and fixed prior to the deck boards being fitted. The handrails and base rails should be cut to length to fit between the posts. Fix the spindles, with a maximum gap of 100mm between each one, into the hand and base rail. Secure the spacers into the grooves between the spindles. You may wish to fix the spindles into the hand and base rail as a ‘panel’ to be slotted between the posts once the spindles are secure. We suggest that spindles are screwed or nailed into place and that the packing spacers are pinned into position. Repeat for other sections as required. Why do local tradesmen pick us? We offer free delivery throughout the West Country if you spend £100 or more. 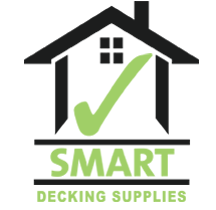 Our expert team can help you to find exactly what you are looking for at competitive prices. We only offer the highest quality products and materials for our customers. Using our 20 years experience, we can source almost any material quickly and easily. Our staff will do whatever they possibly can to make sure you finish your job happy!